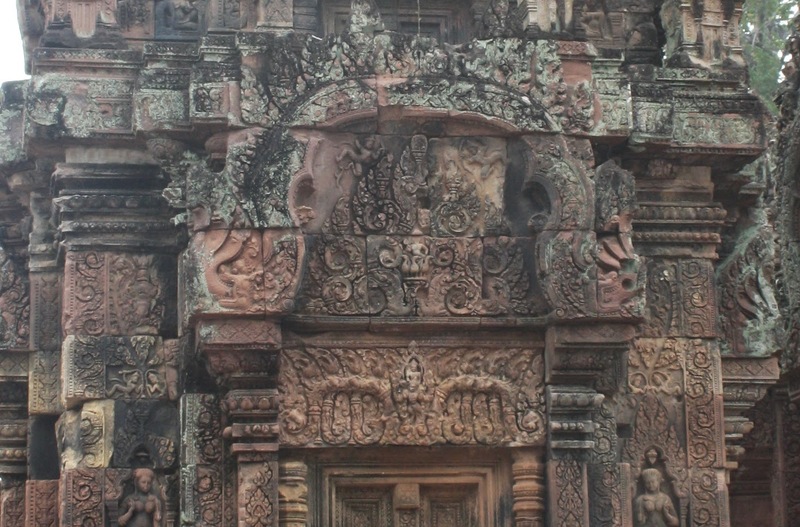 Since the Angkor temples were originally Hindu temples, the walls have a lot of carvings from Hindu mythology. Interestingly, the pediments above the doors of some of the shrines have been carved with images of the guardian Gods of that particular direction. 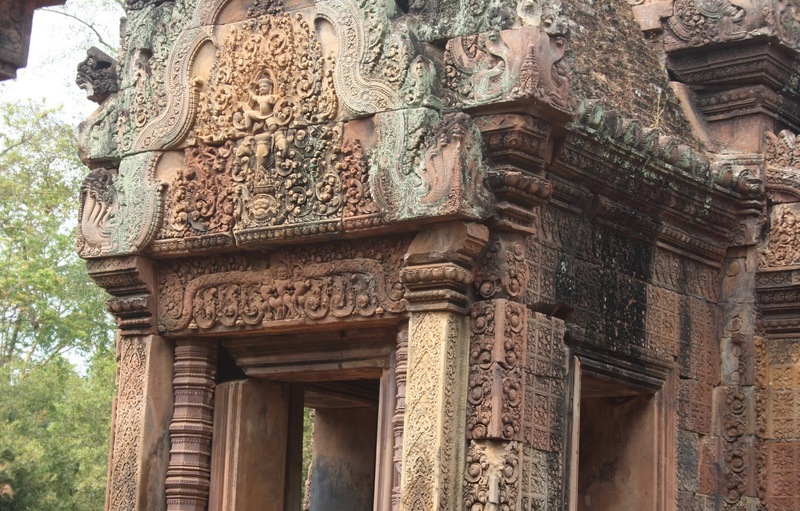 We discovered this for the first time at the beautiful miniature temple of Banteay Srei. Personally, though I have more than a nodding acquaintance with Hindu mythology, I didn't know which God guarded which direction. It was interesting to see this theme coming up over and over again in other temples. 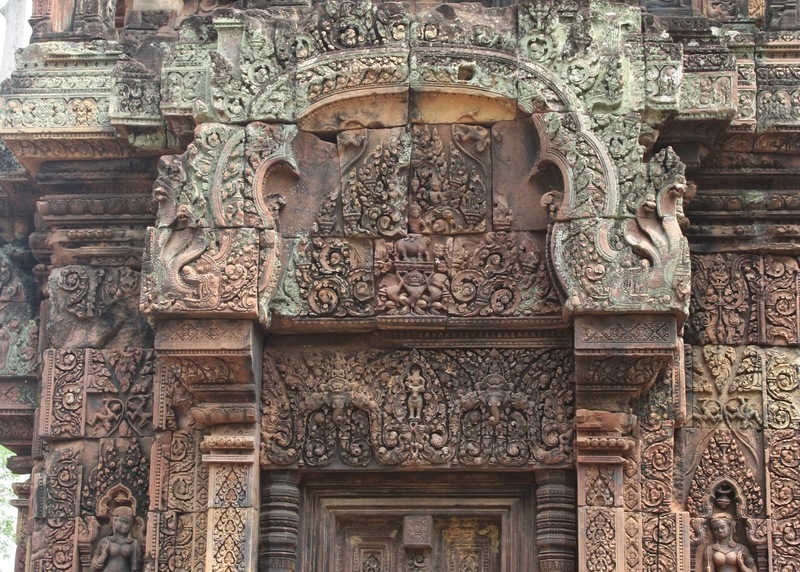 The below photos are all from Banteay Srei temple. Please excuse the quality of the photos - the carvings are so fragile that many parts of the temple have been closed off, and we had to really crane to see these from afar. I've also cropped the original photos so as to focus on the pediments. Indra, the King of the Gods, is the guardian for the East. He is generally depicted on top of his three-headed elephant, though we saw a single-headed elephant at one place as well. Yama, the God of Death, is the guardian for the South. He is generally depicted on his buffalo. The below doorway is particularly interesting because he is depicted both on the lintel (just above the door), and on the pediment (above the lintel), in different postures. Varuna, the God of Water, is the guardian for the West. He is generally depicted with swans as his vehicle (or were they geese?). At one of the temples, we also saw him on a makara, which is generally considered his vehicle. Kubera, the God of Wealth, is the guardian for the North. Though we Indians generally see him riding his chariot Pushpaka, Khmer art generally depicts him on top of a yaksha, as can be seen below. The "in-between" directions have Gods too, though they were never carved on the lintels (the temple doors always face one of the four main directions). I'd never even heard of Isana and Nirrti. North-East: Isana, an aspect of Shiva. His vehicle is a bull. North-West: Vayu, the God of Wind. His vehicle is an antelope. South-West: Nirriti, the Goddess of Death and Corruption. South-East: Agni, the God of Fire. The Khmers generally depict him on top of a rhinoceros!